I am stepping into the next chapter of my life. Retirement is upon me. I have been working to adjust. It is nice to sleep at night, all night, every night. Many years of swinging shifts around the clock make my body wonder what the heck is up…but mostly we are liking it a lot! Rain keeps coming just about the time we can work in the fields again. I’m not worried. I only have a little to do and plenty of time to do it. 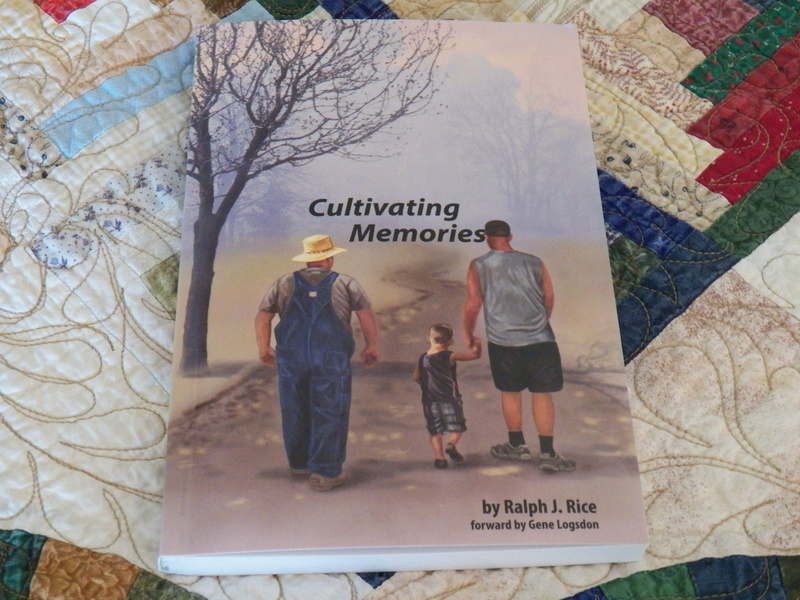 I no longer have to worry about an off farm work schedule…man this is different! Like the sleep…I am liking it! I came down with an awful virus, that had me laid low for a day or two. I am back on the mend and almost ready for whatever comes. I have been in the forge shop working a bit, daily chores and getting things all ready for our timber harvest, as we remove the dead and dying ash trees. In any case, I’m moving into the next chapter, of what I hope will be, a very long and happy book! Where she excels the most is nurturing all creatures, two-legged and four-legged. She closes and opens gates. She hand feeds, bottle feeds and forks hay. She has shoveled more than her share of manure and turned the water off to overflowing water troughs way too many times! The remarkable part to me is that she does all of those things while keeping a clean house, washing a mountain of clothes, cooking, dish washing and nest building, making our house a home. She keeps her finger on the pulse of our family. She keeps tabs on Facebook, remembers birthdays and such and keeps all of us covered in her homemade quilts. On Sunday August 27, we will celebrate twenty-five years of marriage. I am not an easy guy to love. I come with baggage, strange smells and a menagerie of farm animals. I can be abrupt to a fault and very bossy. She takes it in stride choosing to look past my faults and into parts of me that I can’t see. So, today, I will use this public forum to say thank you for not only choosing me, but for staying with me after learning all my faults and shortcomings. Thank you for loving me and my whole brood. Thank you for helping me blend our crazy group even when it seems the wheels have fallen off. You are my hope, my love and my best friend. I ask that you continue to hold my hand as we walk through life. Wherever and however far our journey takes us, together forever no matter what…I will love you. 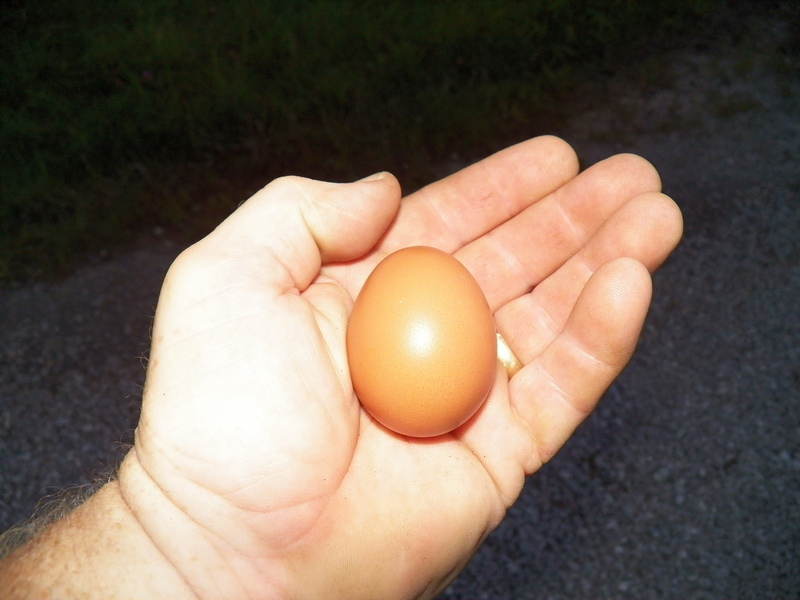 This little egg is from one of our pullets. These little girls are just starting to lay. They take their job seriously. They give all they have and I am thankful. After all, who could ask for more than that? We have been almost six weeks without hens. This is one of the longest stretches in my life, for buying grocery store eggs. I hope it is a very long time before I have to do it again. In my opinion, there is nothing better than farm fresh, free-range eggs… and brown ones to boot! Some will say that I am crazy, white or brown makes no difference. Perhaps they are correct, but for me, brown are best. The freshness is only a problem when you boil them. The shell sticks to the egg white, because a “gas layer” has not had time to form inside the shell. I’m okay with that… I’ll eat mine fresh , thank you very much. Eggs bought in the local store, have been around awhile. Sure they are safe to eat, have a “sell by date” and are pretty good to most folks. I say however, if those same folks tried fresh eggs from happy, free range hens…they might want a change too. If beer is best when “brewed from a mountain stream”, perhaps that is why eggs taste so good from hens who drink fresh water, eat grass and bugs along with choice grains, in a life free from stress. Agree or not its up to you, but I say , “That is “eggs actly” why they taste so good!